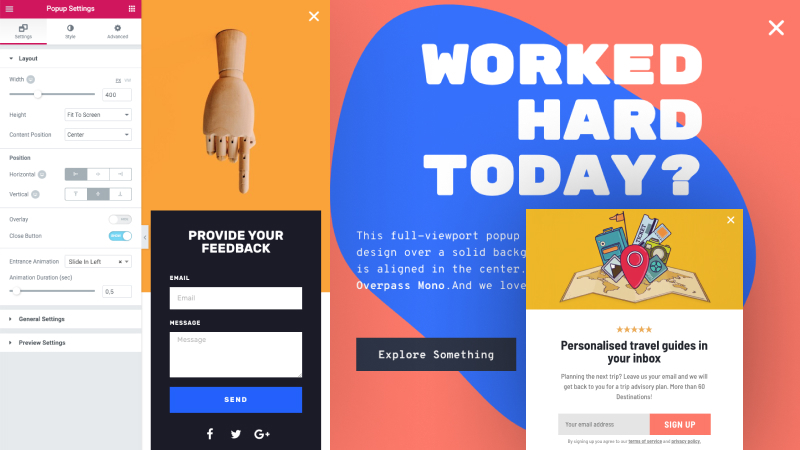 With the recent Elementor Popups builder addition, popups are gaining some serious traction and becoming even more popular as a UX pattern. Now their design and conditional setup is tightly integrated in Elementor, making it a self-containing marketing toolkit. And this simply rocks. I admit that I was too late to experiment with Elementor Popups builder. But once I experienced the cutting-edge management and creation, I just could not get inspirational ideas in my head. Here are three Elementor popups that you can download for free, and use them in your layouts, personal or commercial. You can preview them by clicking the buttons below, and download them as .json file to import into your library. To pop or not? I would definitely advise some reading on the UX side of Popups. They are here to improve our users experiences, not ruin it by over-use. Elementor popups are extremely easy to use, offering very engaging experiences if used right. So, design responsibly and keep your marketing funnels and user flows logically consistent. Show and clear the way for the user with your popup design, instead of blocking it with a popup in the wrong place and timing. Thanks! Hope they will be handy!